R Baker (Electrical) Ltd design and manufacture a full range of reactors, inductors, filters and DC chokes. Our designs include conventional silicon steel cores as well as amorphous metal cores for lowest losses. Our facilities for toroidal winding and specialist equipment allow winding of heavy conductor material to cope with the high currents demanded by many modern applications. This powerful combination of manufacturing capability and design, testing and finishing, ensures a complete service to the customer. Our in-depth understanding of different applications of reactors, inductors, filters and DC chokes enables us to rewind and manufacture to any specification you may require, in high volume or single runs, and to short lead-times. Our electrical engineering team are based in Liverpool in our purpose built manufacturing facility, specialising in designing, modifying and reverse engineering to your specification. All our manufactured reactors, inductors, filters and DC chokes can be supplied with full working drawings, component lists and written instructions in any language. Our range of reactors, inductors, filters and DC chokes can be custom made and are utilised across a wide range of sectors including; rail, switchgear and offshore sectors. 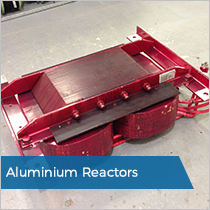 Our client requires a full repair and rewind service on two different types of aluminium transformer and reactors. Our engineering team carry out a full survey and repair service working to the highest standards to meet rail industry requirements. 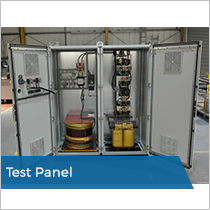 Working closely with our customer we were able to offer a custom built test panel. This required a complex system which offers the facility to test faults in long lengths of cable. This system required our in-house team to manufacture a large air-choke; to restrict the fault current to specific levels required for this test.